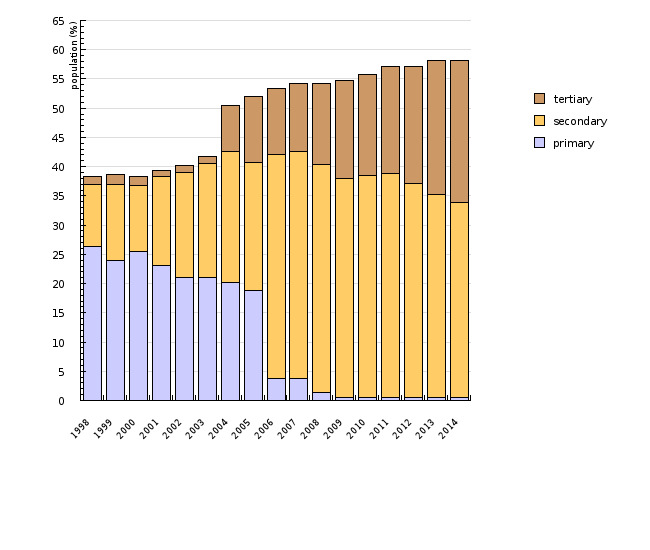 In recent years, the amount of wastewater treated by secondary or tertiary treatment processes increased, while the amount of wastewater treated exclusively through primary treatment processes decreased. The amount of wastewater treated with secondary treatment processes has increased by 205% since 2002, from 38 million m3 (in 2002) to almost 78 million m3 (in 2014). 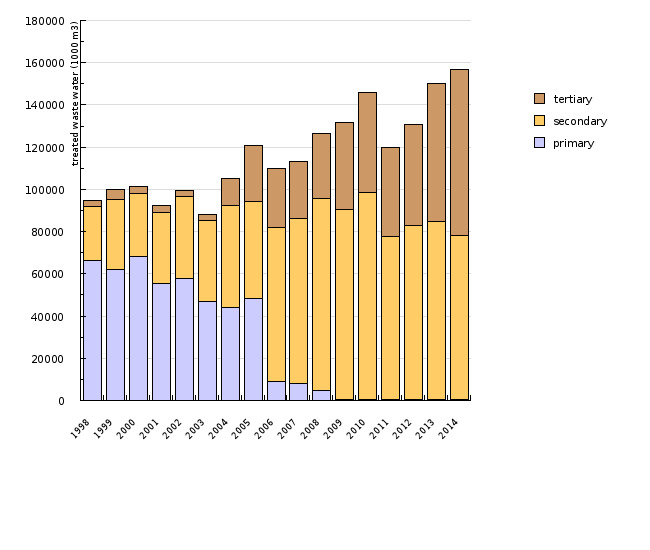 Tertiary wastewater treatment was almost non-existent in Slovenia in 2003, while in 2014, 50% of all treated wastewater, or 78 million m3, was treated by tertiary processes. This indicator shows the quantity of industrial and municipal/urban wastewater and the share of population whose wastewater is treated in municipal/urban and combined wastewater treatment plants classified according to the level of treatment under the methodology determined in the Urban Waste Water Treatment Directive. This methodology was also adopted in the Slovenian Decree on the Emission of Substances in Waste Water Discharged from Urban Waste Water Treatment Plants (OJ RS No 35/96, 90/98, 31/01, 62/01, 41/2004-ZVO-1). In general terms, primary treatment is mechanical and/or chemical. It includes removal of settleable organic and inorganic solids by sedimentation and removal of materials that float (scum) by skimming. Secondary treatment is biological. It removes most organic matter and 20–30% of nutrients. Tertiary treatment removes (apart from organic matter) most nutrients (nitrogen, phosphorus). To ensure protection of all surface and groundwater bodies on the territory of the Republic of Slovenia from organic pollution, nitrogen and phosphorus input and microbiological pollution. To construct municipal wastewater treatment plants and sewer networks for all agglomerations specified in the Operational programme for the discharge and treatment of urban wastewater for the period 2005-2017 and to provide collection, discharge and treatment of urban wastewater by the end of 2015 and discharge and treatment of wastewater in small treatment plants for individual buildings by the end of 2017. With the adoption of the Decree on the discharge and treatment of urban wastewater at the end of 2015, transitional periods for the construction of small urban wastewater treatment plants in sensitive areas were extended to the end of 2021 and in other areas to the end of 2023. The level of development of wastewater treatment systems varies greatly between the EU Member States. Approximately 70% of the EU population is connected to treatment plants. This rate is greatest in the Netherlands where 99% of the population is connected to treatment plants. In Spain, Germany, Italy and Austria, the rate is around 90%. According to 2014 data, the connection rate in Slovenia is 58%, which means that Slovenia is ranked among EU countries with a low percentage of population connected to urban and combined wastewater treatment plants and that almost half of the population still uses septic tanks. Of these, less than 1 per cent is represented by small treatment plants with a capacity of less than 50 PE. For existing small municipal wastewater treatment plants with a treatment capacity greater than or equal to 50 PE and lower than 2,000 PE (in which urban wastewater from agglomerations with a total load greater than or equal to 2,000 PE will be treated), the deadline of 31 December 2020 applies rather than the above stated deadlines. adequate treatment with additional microbiological treatment during the bathing season in catchment areas of bathing waters (for urban wastewater from agglomeration with a total load greater than or equal to 500 PE or for municipal wastewater treatment plants with a capacity greater than or equal to 500 PE) in cases of indirect discharge into groundwater or direct discharge into surface waters, no later than by 31 December 2021.
to provide adequate treatment outside sensitive areas referred to in the preceding paragraph, no later than by 31 December 2017. In cases of existing buildings in which no treatment is provided or treatment is not compliant with regulations that were in force during the construction of such buildings, the deadline is 31 December 2021. In cases where treatment is in accordance with regulations in force during the construction of such buildings, adequate treatment must be provided no later than during the earliest renovation of the building. In agglomerations with a total load below 500 PE, subject to economic assessment of equipping such an agglomeration with a public sewer network and an urban wastewater treatment plant or with small wastewater treatment plants, the deadline is 31 December 2023. In exceptional cases in which urban wastewater treatment in a small treatment plant is not feasible due to prohibited discharge of wastewater into waters or special circumstances that can negatively affect the operation of a small treatment plant (e.g. altitude above 1,500 m, etc. ), urban wastewater will be collected in no-flow-through septic tanks.